Artist Jane Mackay’s firing process curves the edges differently every time to give each free form bowl its own flowing rippled edges and create a unique work of art. 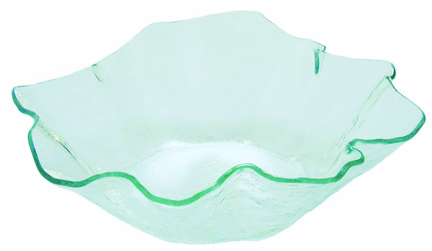 Perfect for salads or serving buffet items. The edges are hand polished to a satin smoothness that resists chips or scratches. Bowl measures 14″ in diameter. Safe for commercial dishwashers. Ships immediately.